Though the majority of you may likely resist the ideas that follow, I do believe that, in an increasingly apparent way, this will be the future of online collaboration, learning and cyberprofessional work: online real estate and fully immersive 3D environments, digital 3D worlds in which most any work or learning activity can be carried out. It maybe yet a relatively distant future, but that is where we are directed. Second Life, is for example the latest 3D digital world imagined, created and owned by its own inhabitants. In it you can chat, play games, build houses and meet with other people. 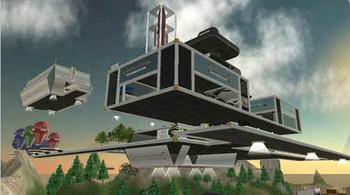 In Second Life you can have your own land on which you can literally "build" any permanent structure like a house, an office building or a public entertainment space. Like in the real world you can rent the land you need and only pay for what you use. Nonetheless the above, most people will have a hard time understanding or even grasping the potential that these virtual online estates truly represent for our online future abilities to communicate and learn more effectively. In my view, there are some key unique characteristics of these immersive virtual spaces that make them particularly effective in replacing and extending the abilities of present-day real-time collaboration systems. In Second Life the lack VoIP (voice over IP) is in my modest opinion a strong handicap and one that would add a whole new layer of spontaneity and immediacy to the whole space. Integration of VoIP in these types of spaces, not only is very feasible without needing to tax excessively user system resources or bandwidth, but it is implementable in ways that may greatly enhance our abilities to replicate typical interactions and behaviors of the physical world. A good example of this is the use of spatial VoIP inside 3D immersive virtual spaces. Pioneered by SmartMeeting, a cutting-edge developer of collaboration spaces and online conferencing facilities, SmartMeeting has integrated this breakthrough VoIP technology in his own solution. Inside SmartMeeting not only one can talk to anyone else without needing to press any button, but the sound is set to reflect the spatial position of its origin. So if you walk away from someone your voice volume will lower increasingly while if you move around me I will be able to hear your voice coming either from the left or right hear depending on your position. One of the greatest advantages of this spatial sound technology is that multiple voice meetings can go on within the same space simultaneously, as long as the individuals engaged in them are separated by enough space or virtual walls. But what are the other advantages of collaborating or learning inside a 3D virtual immersive workspace? 1) The space is persistent. What you create, leave, or place somewhere remains there as in the physical world. If you leave your newly built gamma ray telescope in your front yard, or a specific book on your personal desk, that is where you will find it tomorrow. 2) Videoconferencing not required. Immersive 3D virtual worlds are inhabited by so-called avatars, that is virtual representations of human beings that act in your place inside the synthetic world. Avatars can be as elegant and good looking as you design them, they look always sharp, shaved and having had a full sleep no matter what you actually went through the night before. No need to do make-up and check the lights in your room before conferencing. Your avatar is always in great shape, plus it can be dressed, customized and characterized in an increasing number of ways (see Yahoo Messenger avatars to see another example of where we are directed with this). 3) Your learning experience inside a 3D virtual space can be arranged as a modeling scenario. The virtual space can be designed to fit your specific task needs with a flexibility and immediacy impossible in real life. You can have the best and most appropriate setting for each activity you want to carry out. Space and objects can be resized, moved and placed anywhere you like. 4) Exploration and discovery are enabled. Ideas, prototypes, simulated interactions can be explored and tested out with much greater confidence as the possible damage, risks, costs and time required are truly negligible. 5) Risk can be my guide. Dangerous and unorthodox exploration of new spaces, approaches, methods and tools is given maximum support in a virtual space where everything can be tried and no-one gets hurt. Though we are not used to think of school in these terms, think of applied arts, electricity, physics and even sports training. See the benefits? 6) Fantasy and imagination can be unleashed. Can you do so in your traditional classroom? How much opportunity have today students (2004) to venture into real imaginative spaces to explore and prototype new ideas, tools, artifacts and architectures? 7) Virtual 3D spaces allow the potential full recording of any activity, interaction, exchange. As a consequence such recordings enable the ability re-experience or re-use of past events for many different purposes. Recorded artifacts and the ability to manage them at a fine, granular level will greatly expand our abilities to learn from other people experiences, and to re-use them effectively to achieve our goals more rapidly. Time navigation will be possible in as much the virtual space keeps track of people, events, objects, and relationships among them. 8) Creed, skin color, look don't count much in these virtual spaces and allow individuals to be credited for their true value and not for the dress or the look they have. 9) People who carry major physical handicaps appear as capable and beautiful as anyone else. 10) The ability to wear any type of body and to customize your own look gives many people the opportunity to express themselves as they truly feel and not as society forces them to. "it's not unusual for teachers and students to use an online environment like a chat room to meet. But Delwiche and a few other college professors are taking advantage of Second Life's fully three-dimensional virtual world and are the first to teach classes in a world where the students can fly, change body types at will and build fantastical structures that can float in the sky. ..."Their focus is experience," she said. "It's whatever their individual perspective is. They come into Second Life trying to explore their ideas as they relate to a digital experience." ...To date, in addition to Delwiche and Beamish, professors from San Francisco State University, the Rochester Institute of Technology and Vassar College have used Second Life in their courses. Delwiche said it's an opportunity to show his students a different side of the digital media they hope to be creating in the future. "It's really difficult to understand new media or cyberculture or the ways the internet is transforming our culture without actively participating in it," he said. "The thing that's appealing about Second Life is that it's a shared virtual experience, and so it has that common element that the classroom brings." To Beamish, who teaches urban planning, Second Life provides an alternate palette with which to engage her students. "I use Second Life for students to explore ideas about public space and what makes a good public space," she said. "Being in Second Life all of a sudden puts them in this different environment, which is similar but different, and it forces them to explore how they think about these things...."
Second Life costs USD $9.95 per month which provides you with access to all of its features and facilities. A seven-day trial is immediately available (credit card required). SmartMeeting costs USD $ 20/per user/per month and it offers a free, fully functional 30-day trial. "It is not technology but experience that makes reality virtual and the virtual reality." 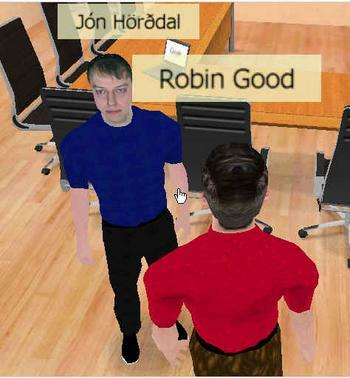 There are now more advanced tools being developed for conferencing in virtual worlds such as Second Life. Here is a link http://www.i3dnow.com/blog/?p=12 to video demonstration of a Collaboration Suite that replicates many familiar apps for collaborating, in the virtual world. Just wanted to add to the list our software which is pushing forward real time collaboration in web application development. It is called WebFusion Studio (http://www.webfusionstudio.com ). It is still in Beta and we look forward all the advices you can give us to make it perfect, but there's already a lot of nice features for you to enjoy (we use it along for our consulting services to build with real time collaboration, websites and intranets). I tried SecondLife without any thoughts but simply to explore the technology. I think we are a while off before it is a reality as a serious tool. To be a serious tool it needs to integrate itself into the desktop environment and reach out into IM and RSS etc. I found the world a little cumbersome and somethnig new to learn. I did like the idea of a complete new virtual marketlpace that sort of integrates into the real world. I also did like the idea of being able to create a virtual world of your own and then share it with others - but these do need to be simplified in how you go about this and the only way for that to happen is to integrate with IM, RSS and even emails and forums. Not too mention it would be good if it integrated with the desktop i.e drag and drop documents right into your virtual computer in your virtual world!